Fishing success improved dramatically as the calendar turned to mid-April, and has continued to accelerate into the month of May. 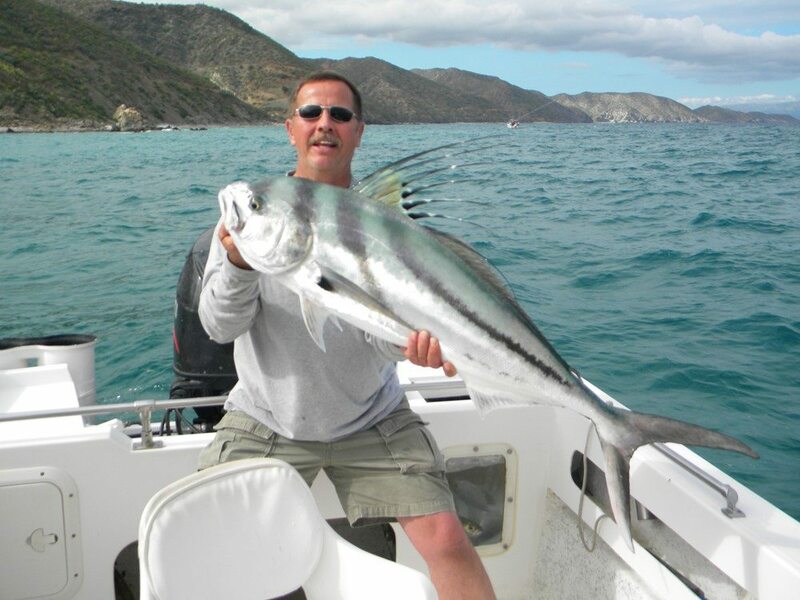 Multiple species are on the prowl, and anglers are ranging far and wide across our fishing grounds depending on what preferences they have for a day’s fishing. Yellowfin tuna appeared suddenly and the season started with some boats landing ten-fish limits of 15-30# fish right out of the gate. Then, a few fish topping 50# were caught, and before we knew it the 100# size came to the dock. Such strong tuna fishing in early May bodes well for the season overall, and is 1-2 months ahead of schedule depending on historical norms. Roosterfish, in turn, haven’t disappointed either. The inshore bite got started first with fantastic pompano action and nice-sized pargo added to the mix, and then 20-40# roosters started snapping. And now, we’ve already had specimens in the 60-70# range caught and released.